Nice 1 bedroom & Loft & 2 bath condo located in the heart of Mammoth Lakes on the green line shuttle stop to the Eagle Lodge Ski Area. Sleeps up to 6 and approx. 1100 sq. feet. You enter the unit from one flight of outside stairs and then the first floor is the living room, kitchen, dining room, bedroom and 1 bath...the 2nd floor is the loft and 2nd bath. The downstairs bedroom has one King bed. The Living Room has 1 Queen Sofa Bed. The loft has 1 Queen bed and 1 set of Bunk Beds. There is one 32" Flat Screen TV, Blue-ray DVD player and VCR & one Queen sofa bed in the living room. Wood-burning stove in the living room and a CD player/stereo. New Carpet installed throughout the unit October 2015. There are 2 outside parking spaces available.Jacuzzi and Sauna on-site. Swimming pool available in the summer months only. Coin-operated laundry facilities located in the common area near the office. Phone in unit 760-924-2897. Wifi Internet Access in unit. TOT LICENSE 3390-WF18. Had a great time at the condo. The house was clean and cozy. Perfect for our ski trip to Mammoth. Thanks again! Place gives the coziest feeling with the fireplace even though it was hard to start (newbie me). Other than that, this place is good for groups/families that want to stay away from the crowd and cook, gather around inside the house. Would definitely recommend! Thanks for accommodating our group. I would come here again when the time permits! Close enough to groceries, restaurant and bus stop. 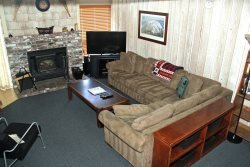 A nice clean condo for a weekend getaway and it is close to the most popular locations in Mammoth. This is the second year weve stayed at Wildflower and its always clean, cozy and a great family experience. The cabin provided us with everything we were hoping for, and happily will refer our other friends to book with you in the future. All the best and thank you. We used to stay at Sunshine Village. Wild Flower is much quieter and feels like we were in a remote part of the forest even though in the middle of town. Very nice. The complex manager was very responsive to our needs and even when not directly available was only minutes from meeting up with us. Central Reservations made the reservation process very easy and we appreciate you working with us when we had to change the date of our trip. It was a very enjoyable experience. Coming back up in the last of September. Very comfortable condo for our family of four. Situation was seamless and effortless. Place was well kept and good to go. Condo was nice with plenty of room. The beds were comfortable. Had a great time, thanks. Very nice place. The kitchen has anything you would need for cooking and overall the condo is very spacious. The bunk bed was fairly creaky but other than that everything was in good shape. We had a wonderful time. This condo is cute, quiet, clean and cozy. Great for families. Super close to restaurants and shopping. We will be back again next year!!! The apartment was spacious and clean. The carpet was new, the kitchen felt a little bit outdated. Quiet and good central location. I definitely can recommend this apartment. Hello Central Reservations, Since you asked, we enjoyed our stay immensely at WF18, and the staff was truly accommodating. The unit was very comfortable and we love your propertys location. We had a wonderful experience with Wildflower. Our condo was adorable and perfect for our weekend trip. Its located in a perfect spot in Mammoth. We were close to all restaurants and a minute walk to get on a shuttle to the resort. The condo was very cozy and very clean. It included brand new carpet and everything you need for day to day usage. It was a great place to stay!